Just over a month ago, we caught wind of anti-free speech and anti-worker Senate Bill 469. This terrible bill was introduced at the hands of some of Georgia’s most powerful corporate and political figures: State Reps Don Balfour, Vice President of Waffle House, Bill Hamrick , Bill Cowsert, and Ross Tolleson, all of who are members of American Legislative Exchange Council(ALEC). 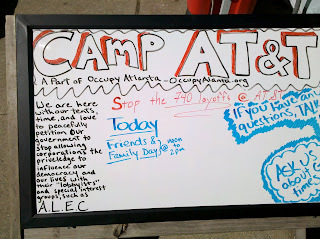 We knew that SB 469 was the product of not only ALEC, but the Georgia Chamber of Commerce. As part of our outreach and overall strategy, we reached out to folks on MARTA and at Waffle Houses in Balfour’s district. 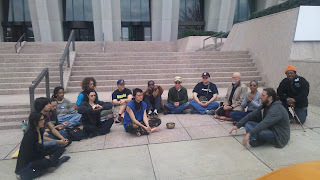 Our strategy also included lobbying our legislators and training and recruiting for mass civil disobedience. Today we had people from all walks of life and political persuasions at the capitol from 9:00 am till midnight, dozens of whom were prepared to commit non-violent civil disobedience if the bill passed. This deep commitment from a broad coalition stopped the bill from ever making it to the house floor. 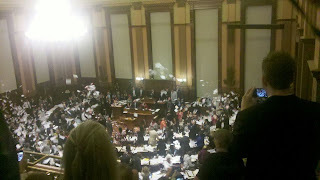 While harmful bills impacting our allies were passed today, the defeat of SB469 sustains free speech for Georgians and empowers us to overcome future legislative attacks. The very human right to publically call out injustice in our communities was renewed and reinforced today. Like a modern day David and Goliath the resources of the 1% were not enough to beat the resourcefulness of the 99%. 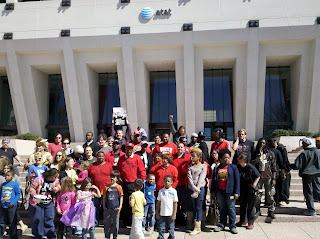 Today at 11am Occupy Atlanta, Communication Workers of America Local 3204 and Atlanta Jobs with Justice came together at the corporate offices of AT&T, 675 West Peachtree Street to celebrate a historic win for AT&T workers in the southeast. For the first time in years workers and allies stood up to mass layoffs at the hands of a corporation that year after year increases the pay of its top executives at the cost of everyone else in the company. 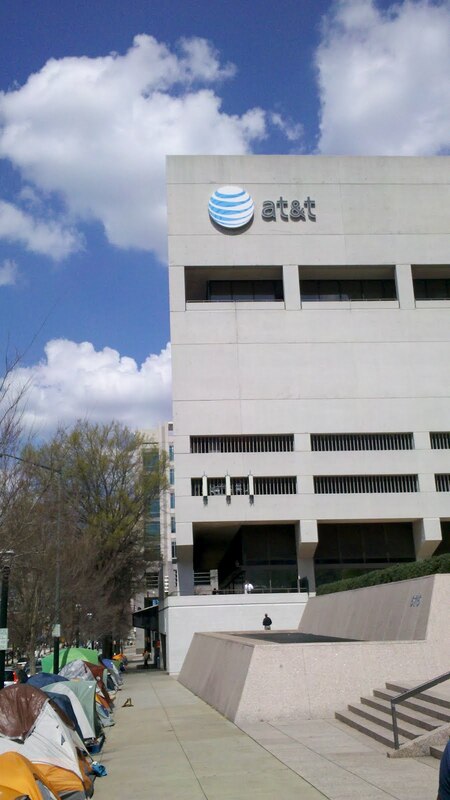 On February 13th, activists staged a sit-in at AT&T’s Atlanta corporate offices in protest to the announced layoffs, 12 people(including myself) where arrested for refusing to leave until layoffs were rescinded. The next day, hundreds of community supporters rallied outside the complex and launched a 42 day long tent occupation demanding that AT&T stop the layoffs and those scheduled to occur on March 15th. American Friends Service Committee has been excited to be a part of the campaign, and we’ve been there every step of the way. 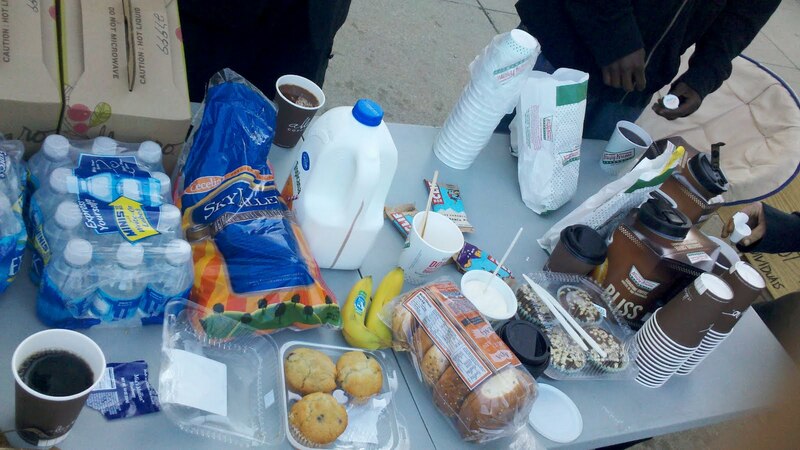 This morning we served breakfast to all the fulltime occupiers to make sure everyone was well fed as we prepared to breakdown the encampment. Later this week Communication Workers of America will host an appreciation dinner for all the hard working occupiers who made this victory possible. At the home of A 62 year old women threatened with being evicted, Occupiers are fighting to save her home to keep a roof over her family's head. Today, March 22nd, while working to save this home from illegal eviction everyone was greeted by multiple police cars and helicopters looming over head. Rather than investigating the clearly evident fraud perpetrated Investors One Corporation, the company that's attempting to claim Chris Frazers home, DeKalb police have turned a blind eye on the one's that needed it most. Shapiro & Swertfeger, the counsel representing Investor One Corporation, have had all of the proper paperwork and knew of the fraud taking place through the chain of title but refuse to expose the injustices. A very predictable move on their part being that lawfirms receive 10% profit from all foreclosures. In addition, the magistrate court judge that handled the dispossessory glossed over the fact that a foreclosure deed wasn't presented at the hearing which is cause for immediate dismissal the paperwork remained unfiled until a week before the appeal was heard. There is currently a lawsuit being filed against all parties that had a hand in these clandestine business practices. The Dekalb County Sheriff's office still didn't hesitate to send out multiple squad cars to stay stationed outside of the Frazer residence. Despite severe budget cuts the county is facing there were cops told to, "bring a book or a movie" to stay entertained throughout the day there were also about five instances where a helicopter was circling the house, hovering for about 10-15 minutes at a time costing the county thousands of dollars. Tomorrow we are expecting an even more blatant show of force on the side of the Dekalb County Police Department. One of the officers camped outside Chris Frazer's home claimed that the police force was present to make sure activist campaigning to save the home weren't being violent. 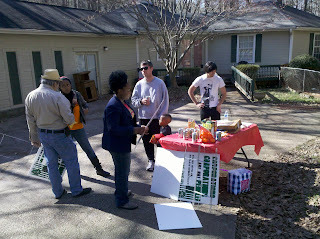 Since Occupy Atlanta have been working with the local community we have been nothing but helpful, organizing community meetings where neighbors can share ideas on how to create the change they want to see, facilitating clean up days, and addressing the issue of abandoned homes on Wellhaun road. American Friends Service Committee is calling on folks to join Chris Frazer and stand against this eviction. 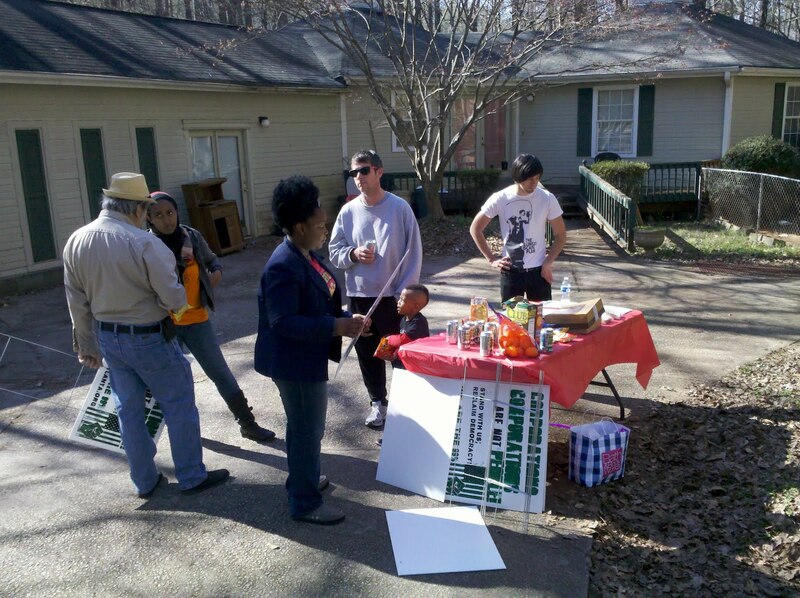 We need folks there between 8am and 5pm, which is the time frame that an eviction can occur. Will you join us? Tomorrow is a big day for Georgia, people are mobilizing at the Georgia Capitol at 11am and I've decided to be a part of it. I'm writing this post in an effort to convince you to join me. Whether or not you believe in the work I've committed myself to over the last ten years or not, I do think most people who would read this believe that Georgians should have the right to publically call out injustice. I believe that most who would read this blog post also would agree that it's wrong to allow the super rich to provide politicians with economic resources in exchange for legislation that protects them from those that would highlight wrongful doing at their hands. Dissent is precious. Without dissent we wouldn't have a weekend, a 40 hour work week, we would still have slaves, women couldn't vote, blacks would still give up their seats on the bus, this list goes on. Dissent isn't comfortable for the anyone, it's a disruption. Right now, in our state there are some troubling trends that need to be disrupted. We're number 5o in loan modifications, we have the 4th highest foreclosure rate, we have the largest prisoner per capita percentage in the country, our unemployment rate is close to 10%, and our income gap is the third highest of any state in the country; we should all be uncomfortable with these troubling realities. Senate Bill 469 has a clear intent to further criminalize our right to highlight injustice in our communities, dissent will become a serious crime if it passes. It's widely known that the language in SB 469 is from model legislation drafted by the American Legislative Exchange Counsel(ALEC). ALEC is a non-profit organization that has existed in the shadows of our political landscape for decades. Corporations pay $50,000 a year to be a part of ALEC, and even more to serve on one of their task forces. Politicians pay $50 every two years to join ALEC's ranks. 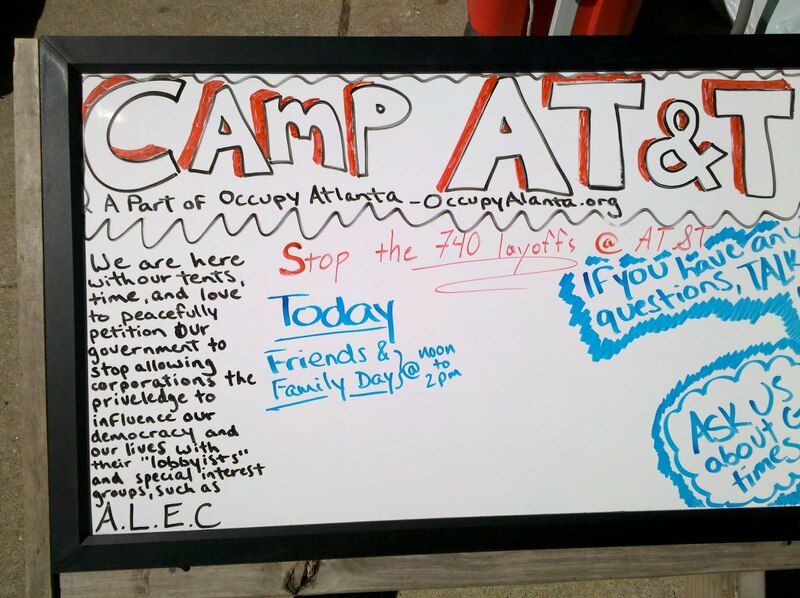 ALEC has super expensive retreats that law makers and their families attend free of charge. These retreats are used to draft model legislation that law makers are assigned with introducing. In the past one out of five ALEC bills have passed into law. What ALEC and SB 469 represent is the idea that the super rich can show up on the doorstep of their local politician with a bag of cash and get a law passed in exchange. Whether you agree with this protest or that one tomorrow is a day to protect our right, your right, to speak your mind, to call out injustice when you see it, to disrupt that which needs to be disrupted. Tomorrow we need a historic action in order to win the fight for free speech. We need thousands. I want to look back and know that I made whatever personal sacrifices required to be a part of what's going down tomorow. Tomorow I will stand with workers, students, teachers, old, young, black, white, brown, religious, athiest, republicans, democrats, anarchists, socialists, and maybe you. We can't afford the attacks coming out of the gold dome this season, it time for some disruption in a system that hasn't been serving us for some time. 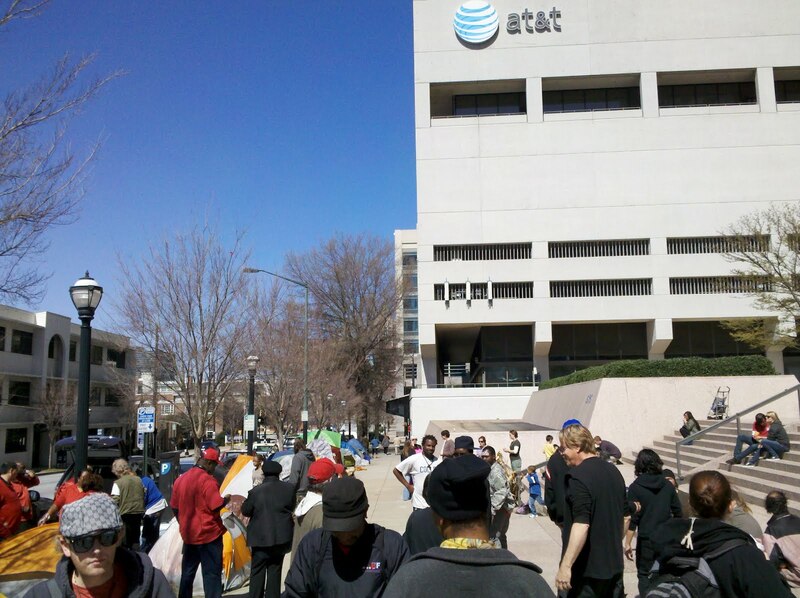 Today was a big day in the struggle to resist AT&T layoffs. For the last three years AT&T has announced layoffs every quarter so tensions were high last night. 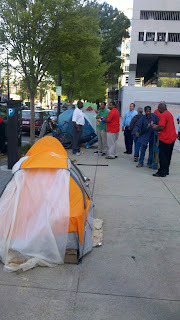 We had seven AT&T workers join us last night, tents and all. 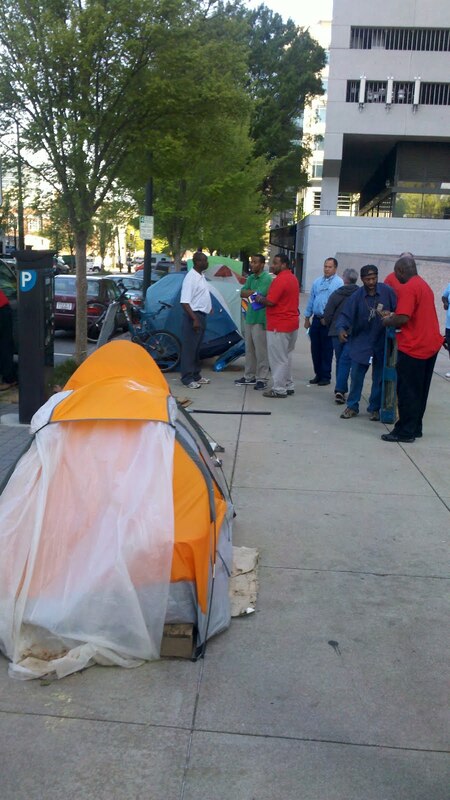 While we were erecting their tents AT&T executives came outside and became visibly agitated, claiming the tents presented a fire hazard and calling on police to do something about the situation. At one point it seemed like police were preparing to move in and evict the camp, but they backed off when Joe Beasley stopped by and confronted police, calling chief Turner and challenging him to follow the letter of the law. 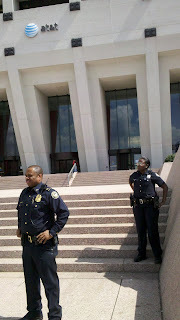 Since then the police presence has greatly increased. Police have threatened to arrest anyone who leans against the wall the interfaces the public sidewalk and AT&T's property. 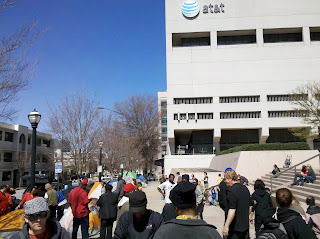 In the morning AT&T occupiers held up banners and passed out leaflets to folks headed to work. 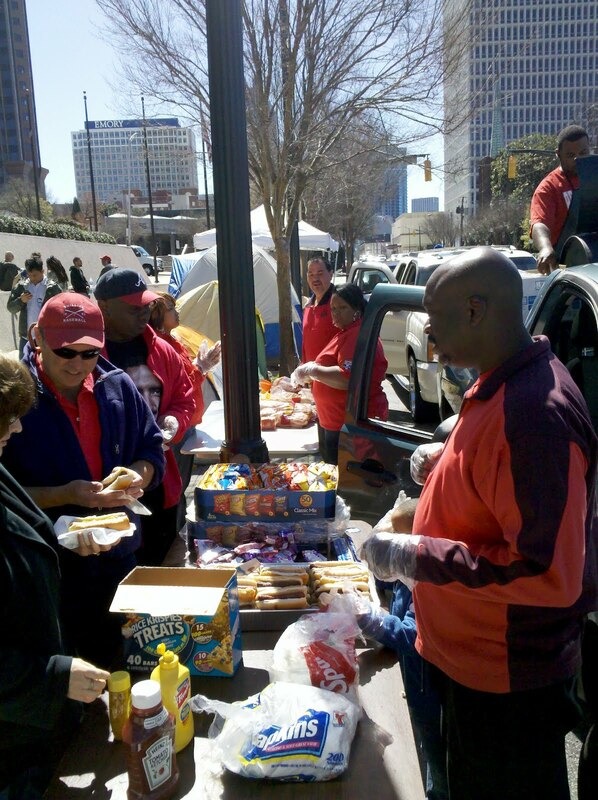 There were prayer services and Buddhist meditation sessions held on the steps of AT&T throughout the day, and Grandmothers for Peace brought a delicious lunch. After Lunch AT&T workers made themselves available to the press to make statements regarding AT&T's layoffs. Rather than typing it out I'm going to post a video I shot of workers fielding press questions. The state of Georgia ranks 4th in the nation for foreclosures at the end of last year, with 350,000 foreclosures expected this calender year. Along with many other metro Atlanta counties, DeKalb County and South Decatur have especially been hit hard by the housing bubble and crash. Ms. Christine Frazer, a 62 year old widow, along with four generations of the Frazer family is being threatened with eviction from the place they have called home since 1994. A notice was signed that ordered a writ of possession be issued on the 15th. 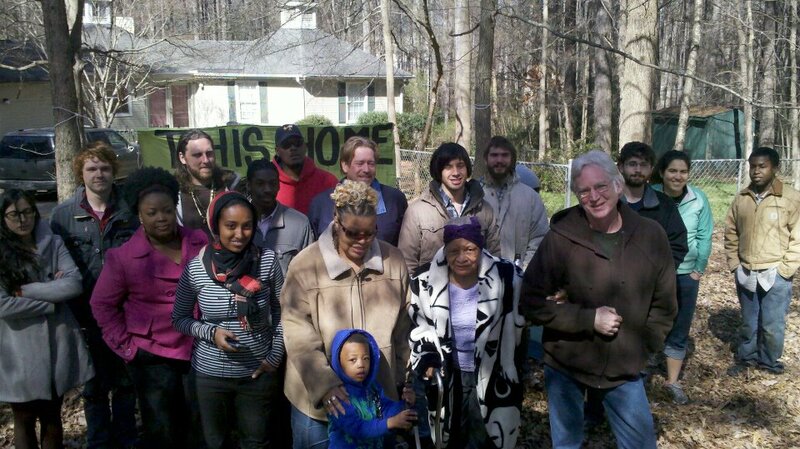 Allowing armed marshal's to forcibly remove this family from their home of 18 yrs leaving them without a place to go. As part of a national day of action, Occupy Atlanta along with other organizations will be gathering for a Speak Out against foreclosures to stand up for not only this family but all families in similar dire situations. 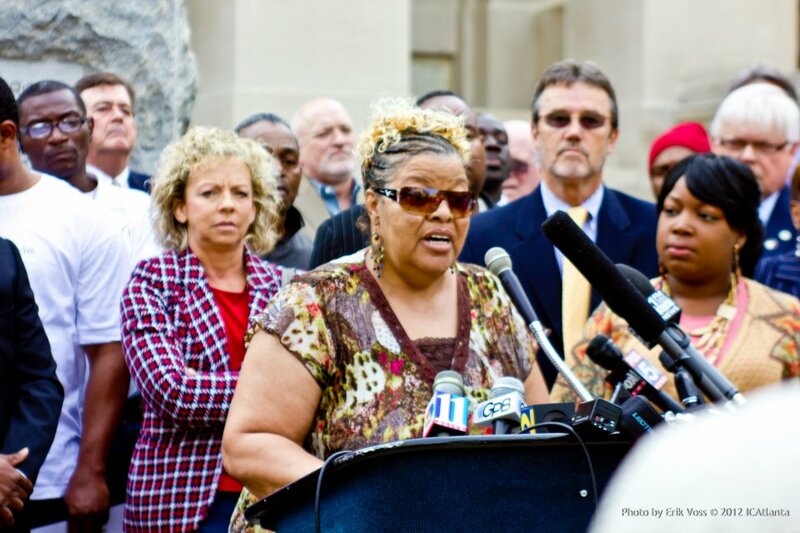 We will hear their personal stories as well as them condemning the process that allows for these injustices to occur. We plan to expose those responsible for the heinous crimes that are robbing the working class people. Young Activists Step Up At Cross Keys High School! Yesterday I was invited by several Cross Keys High School students who I've worked with Through Student Career Alternatives Program. 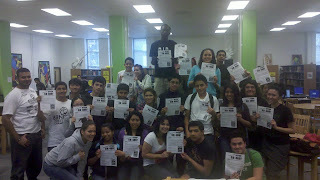 The meeting was called in response to the impact that the viral youtube video Kony 2012 has had on Cross Keys students. The meeting was really well attended and I was super encouraged at how politically astute all the students were. They had already developed the analysis that the Invisible Children organization that put together the Kony 2012 campaign was problematic, but the students wanted to harness the hunger for social change that the viral video evoked in their classmates. We spent some time talking about local issues that students would like to address including immigration reform, homophobia, homelessness, and teen pregnancy. Several of the students suggested meeting again and attempting to pull in students from other area high schools. Everyone in the meeting committed to come out to this Saturday's rally against SB 469 which criminalizes disent. 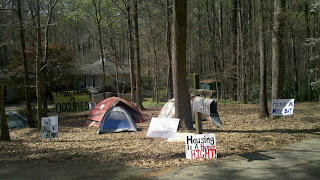 I'm really encouraged to see students stepping up to create the Atlanta they want to live in. Please spread the world about the next meeting which is open to all Atlanta area teens! Home Defense From Atlanta To Columbus! 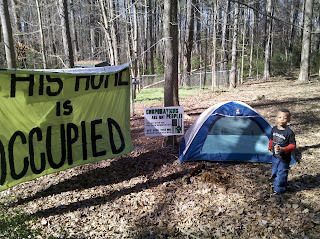 This past Monday I had the pleasure of going down to Columbus, Ga to meet with the newly formed Home Defense committee with Occupy Columbus. The group is small but determined to take on the housing crisis facing many in the Columbus area. The group definitely expressed being inspired by the work in Atlanta and see Home Defense work as a way to strengthen their work in Columbus and make a real difference in hard working folks that are really struggling to get by. The American Friends Service Committee expresses deep concerns over Senate Bill 469, which passed the Georgia State Senate on March 7. If approved by the Georgia House and signed by the Governor, SB 469 would criminalize acts of peaceful protest, including picketing, outside of any privately owned buildings related to labor disputes. Individuals who participate in such protests could be fined up to $1000 a day, and organizations, which support such actions, could face penalties of up to $10,000 a day. Moreover, the bill adds a category of “conspiracy to commit criminal trespass,” which would make it a high and aggravated misdemeanor to plan acts of peaceful civil disobedience. The bill also includes provisions that weaken the power of workers to organize unions and bargain collectively with their employers by restricting the ability of workers to negotiate contracts with employers that provide for union dues and agency fees. As a Quaker organization with a long record of upholding civil liberties and putting the principles of peaceful protest into practice, and as an organization that has long stood for the rights of workers to bargain collectively with their employers, the American Friends Service Committee calls for this bill to be rejected. We encourage folks to call Georgia law makers in regards to this bill and share your concerns with them. In addition we urge all to join workers, people of faith, and social justice advocates Saturday March 17th for a mass rally against SB 469 at 11am at the state capitol. 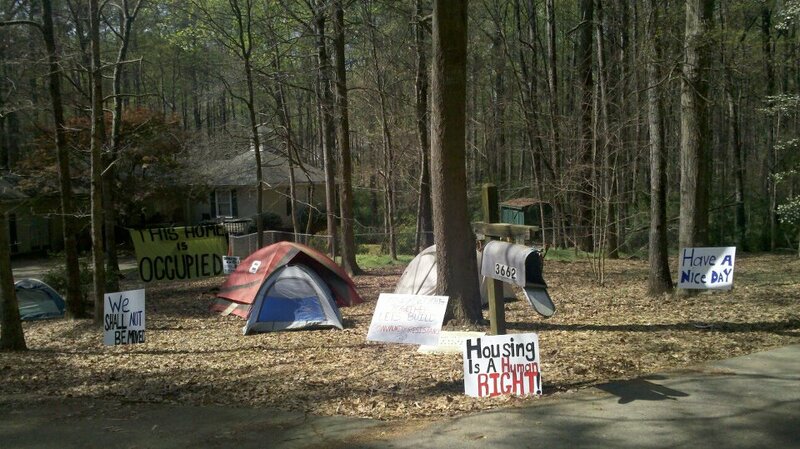 About a dozen folks showed up to the first community meeting held at Occupy Atlanta's newest home occupation in South Dekalb yesterday. 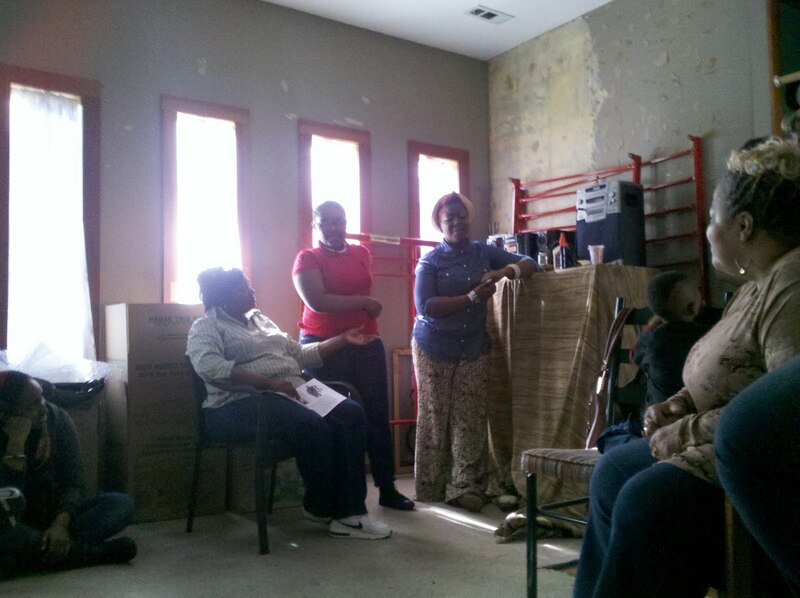 The community meetings have become a staple for home occupations, bringing folks from the neighborhood together to get to know each other, discuss the things they would like to see change in the community, and make a plan to work on it. Several big ideas were discussed, including problems with the k-12 school system, and the juvenile justice system. At the end of our first meeting we decided to start small by addressing the issue of apathy and trash. The concern was brought up that many in the community had simply checked out. Houses have been abanded for years on Wellhaun road, and trash pills up. So next Saturday at 8am we want the community to see us doing what hasn't been do in a while, cleaning stuff up! We also decided to host a speak out against foreclosures this Thursday at 11am at The Frazer house(3662 Wellhaun Rd, Decatur) we will have several video cameras to record the stories of folks facing foreclosure/eviction and the people fighting side by side with them. 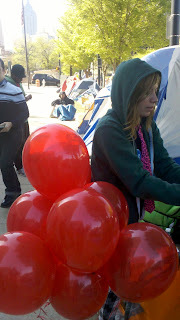 AFSC was able to pitch in and support this new occupation with some resources but they need more. Here's a short list created by folks occupying the home, will you pitch in? 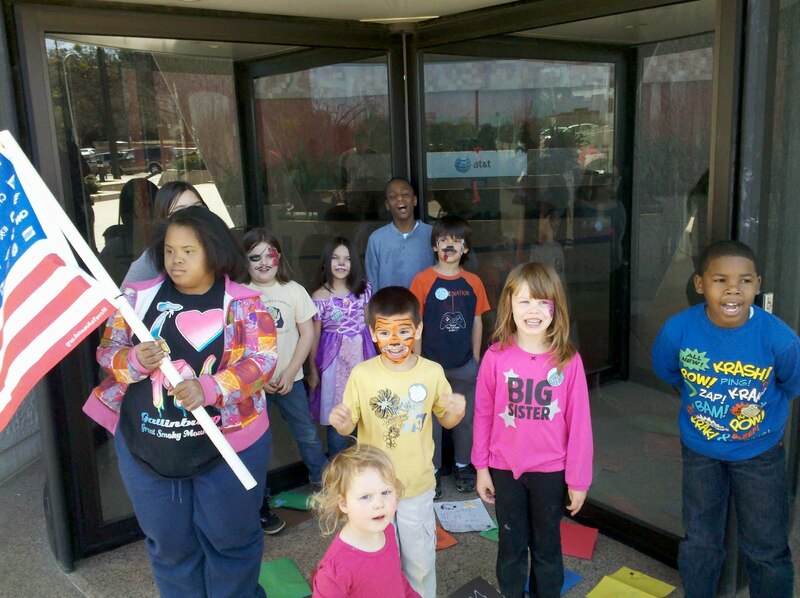 Yesterday, at Camp AT&T, we had our first family and friends day and it was a huge success. 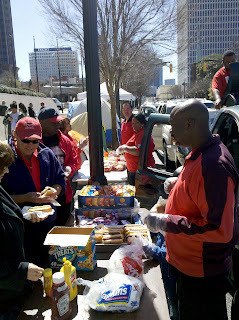 It was a beautiful site to see workers and their families breaking bread and building community with folks from Occupy Atlanta. Communications Workers of America brought a massive grill and made sure there was tons of food for not only those who showed up, but those who were simply passing through. 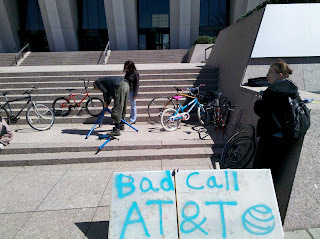 Occupy Atlanta brought through its excellent mobile bike shop, which was enjoyed by both kids and adults. We had lots of fun stuff for all the kids to plug into. 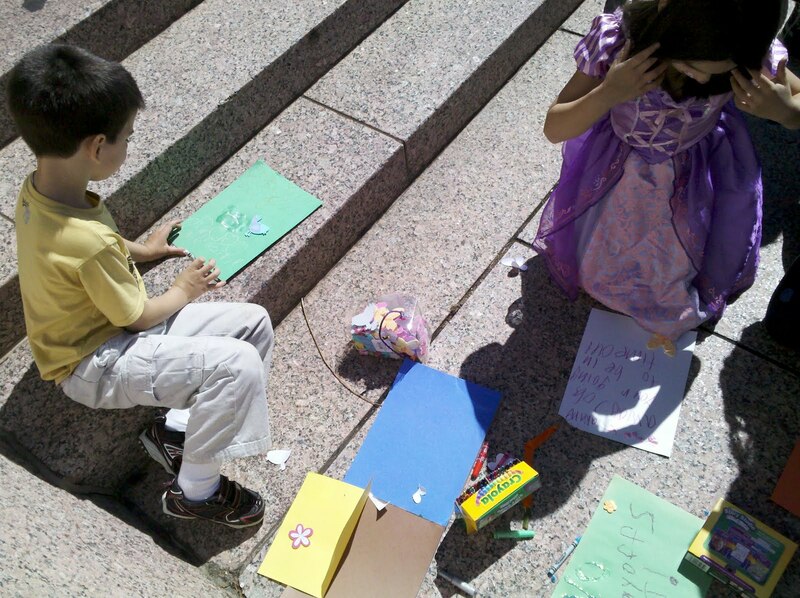 One way that kids plugged into the campaign to stop the AT&T layoffs was to use their creative minds to make letters out of construction paper, glitter, crayons, and stickers addressed to AT&T. The letters all had slightly different messages but they all basically asked AT&T to stop the layoffs. One young lady event threatened to put AT&T on timeout if they didn’t stop the layoffs. 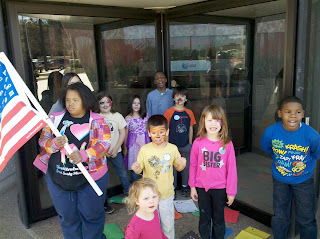 After writting the letters, the kids delivered them right to AT&T's front door and chanted, "AT&T, quit taking jobs!" Saturday’s family fun day was a great example of how the face of resistance isn’t always what we imagine; it’s not always holding a sign in the street, or going to jail to challenge injustice. Sometimes resistance laughing, breaking bread, and building community; sometimes it’s holding a spiritual service on forbidden private property, sometimes it’s occupying an uncomfortable space for weeks to visibly demonstrate commitment to justice in your community. Saturday resistance was filled with children playing, folks laughing, sharing meals, and talking about the Atlanta we want to live in. American Friends Service Committee provided printing and facilitated the arts and crafts projects for kids. 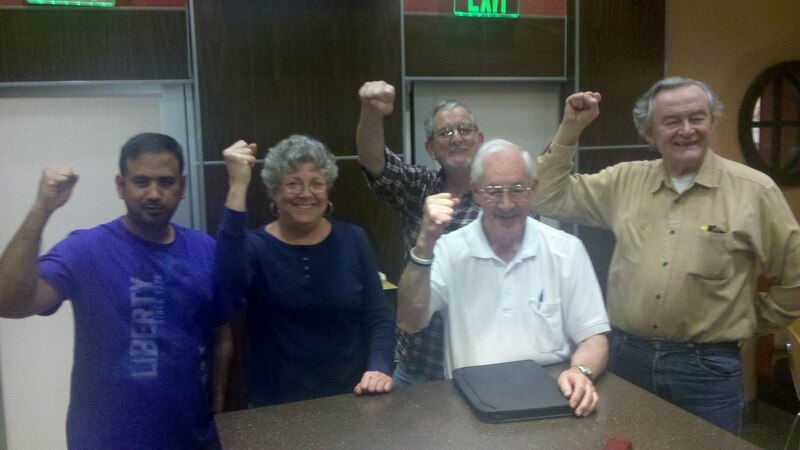 AFSC is committed supporting the ongoing struggle against layoffs at AT&T and the rest of the city. This is an important week for the AT&T struggle. Not only are we facing terrible legislation which appears to have sections specifically targeted at our actions at AT&T, but March 15th could be the day that more layoffs will be announced. So we have a numbers of actions big and small that we would like to ask you to participate in. Monday 1pm, Media Workshop; how to tell your story. Tuesday 1pm, Movement meditation; using our bodies motion as a transformative power. Wednesday, We need to get as many new campers out as possibly! Our goal is to surround the block! 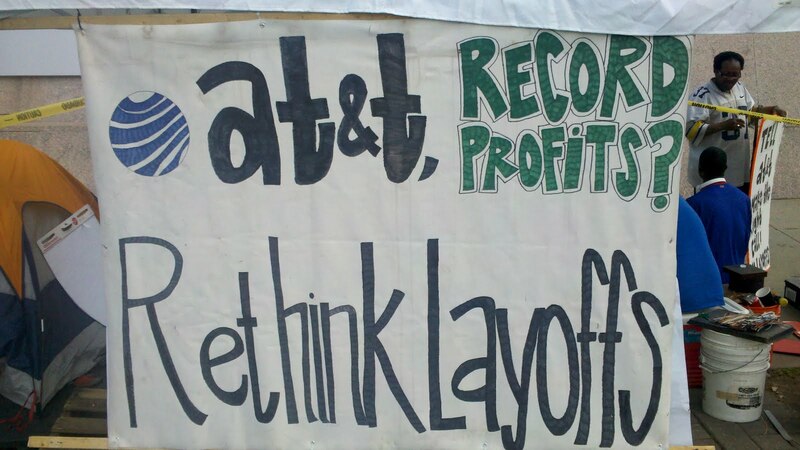 AT&T want more layoffs, we need to make them think twice! 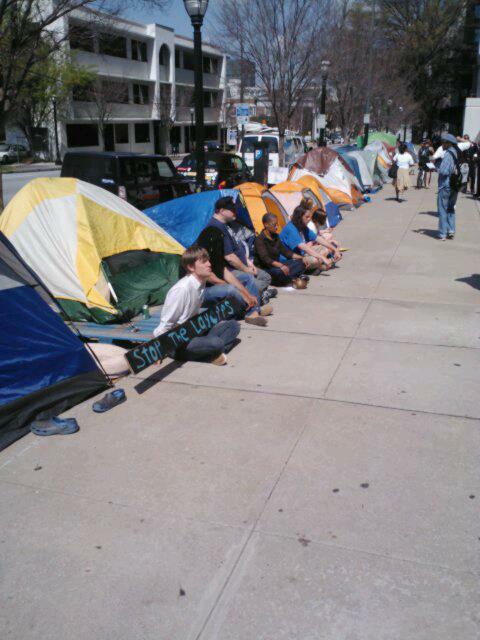 The workers have committed to help us grow the camp Wednesday night, can you join? 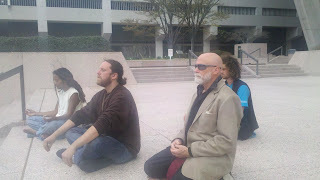 Thursday 1pm- Starving the hungry ghost meditation on the steps of AT&T. These meditations have been really powerful and totally non-religious. I must say that they also strike a pretty powerful image for those passing by. 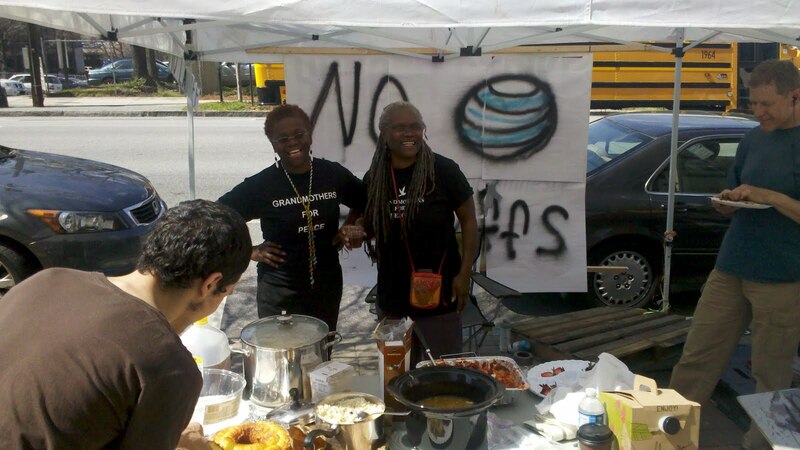 The Occupation of AT&T started on February 13th, the day before Valentine’s Day, with 13 tents. The mission was simple; win back 740 good paying union jobs from a company that’s pulling record profits. Since them the occupation has grown, adding almost a tent every day and exploring creative ways to escalate our campaign to save much needed jobs. The task is nowhere near over but there has been progress. 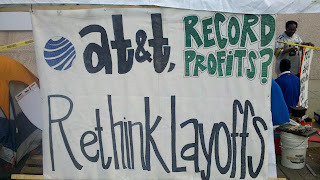 AT&T is on the defense and we know that they have rescinded 33 of the layoffs, which is a good start. The last two days there have been multiple mic checks in side of several AT&T buildings and a group meditation on the steps of AT&T in an effort to build compassion in the hearts of seemingly heartless AT&T executives. 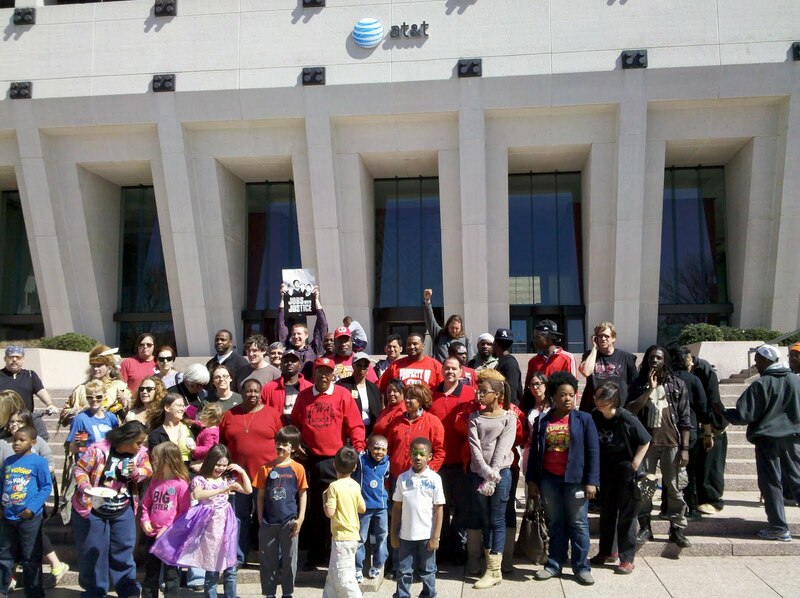 This Saturday join workers and their families for a Family fun day at the steps of AT&T. Ms. Christine Frazer, a 62 yr old widow, along with four generations of the Frazer family are being threatened with eviction from the place they have called home since 1994. Mrs. Frazer refinanced her home in 2001; but after losing her husband in 2002, taking in her elderly mother in 2003, losing her job in 2009 due to a “no-fault, one-minute-late tardy policy,” and being denied unemployment after two appeals, she was left with no way to pay her mortgage. The very same crumbling economy that caused the value of Chris’ home to depreciate left her hopeless in today’s highly competitive job market. Mrs. Frazer’s home was foreclosed on in October of 2011 after faithfully paying her mortgage for over 15 years! 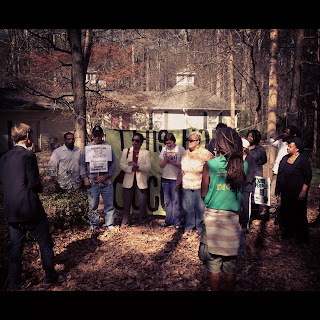 Investors One Corporation sent her a statement claiming she had to pay $176,000 on a house that the very same document stated is only worth $40,000.This foreclosure is wrongful and Occupy Atlanta will assist Ms. Frazer in the fight to expose the fraudulent actions that have taken place. Many other families and individuals across America have fallen victim to these unlawful practices and Occupy Atlanta is fighting against such injustices case by case. 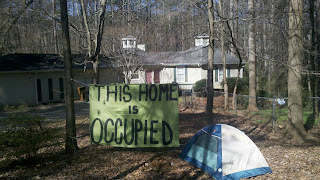 Leila Abadir, of the Occupy movement, stated, "
"Occupy Atlanta was introduced with the compelling story of four generations of a family being evicted from their home. We are genuinely touched by all families across the U.S being affected by financial hardships caused by the mortgage bubble, those both burdened with insurmountable debts that will forever loom over their heads and those that were robbed of their homes, but this was a particularly touching story due to its many inconsistencies, inconsistencies that could have easily been uncovered and kept this entire family far from the last steps of eviction. Chris’ story represents the story of so many families across America that are being robbed of their security by big banks and investors that continue to profit off the backs of the working class people. " AFSC is excited to support this important, historic work as the Atlanta metro area faces hundreds and thousands of foreclosures this calender year. 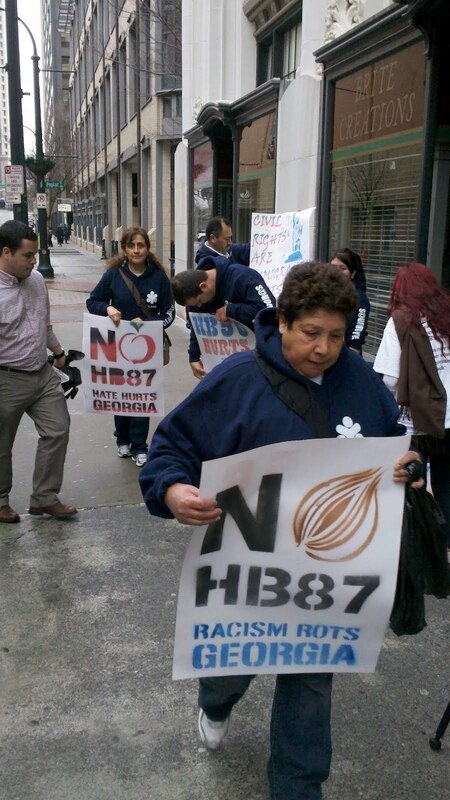 Today a broad coalition of labor and community organizations joined forces to publicly renounce Senate Bill SB 469. 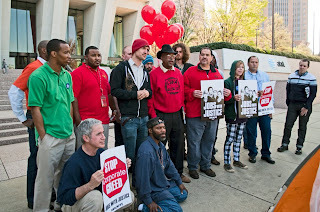 Members of over 25 different organizations including Atlanta Jobs With Justice, Teamsters, ACLU Georgia, Georgia Labor Council, AFL-CIO, Communication Workers of America, Working Women 9 to 5, and members of the Occupy movement joined to committ to fight the bill that, if passed, would futher criminalize acts of civil disobedience including sit-ins, pickets, and protests. The bill was drafted by the American Legislative Exchange Counsel(ALEC) and introduced by several ALEC members in the Georgia senate. It's widely known that AT&T sits on the board of ALEC and has a vested interest in silencing those who oppose their current slew of layoffs. Martin Luther King the third was one of several speakers who lended their opposition to SB429 at todays press conference, sadly we didn't record his statement. Below is some footage from todays footage from today. Today the ACLU and others were in the 11th Circuit Court of Appeals challenging the constitutionality of Georgia and Alabama's discriminatory "show me your papers" laws. In both of these states, we've seen the devastating consequences these laws have had on their economies, reputation and communities. 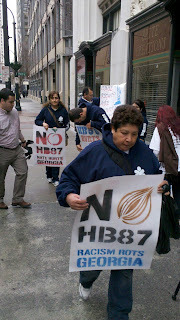 During the hearing many of us participated in a picket/vigil organized the the Georgia Latino Alliance for Human Rights(GLAHR)outside the courthouse.